We all suffer from periods of self-doubt, negativity and unwanted emotions at times, however most people are able to cope with these and understand that they are simply going through a bad phase - after all, if your clients never have a bad day then how will they know when they're having a good one? 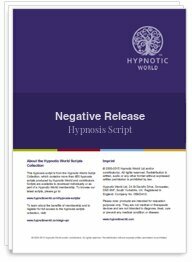 However, if these negative thoughts and emotions seem like a black cloud constantly hovering over them then this hypnosis script download can help your clients to deal more effectively with those negative thoughts and emotions and get on with the business of enjoying life. This Negative Release hypnosis session is interactive in order to help you and your client to identify and deal with whatever is bothering them.